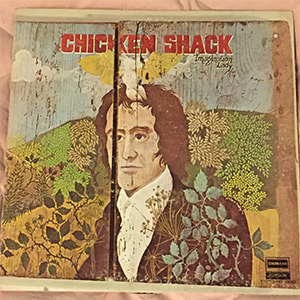 Chicken Shack is/was the brain child of Stan Webb. The group has had many incarnations since it’s inception back in the 60’s, but the one musician that has always been constant is Stan Webb. You can think of them as the poor mans version of Kim Simmonds and Savoy Brown. For those of you that have never heard of the band don’t fill to bad. We have been listening to the band for many moons and have not meet many people who have heard of them. The band scored a couple minor hits with their first two records but after their lead keyboardist/vocalist at the time Christine Perfect left the band back in 1969, Stan Webb and company never created any music that fit into the radio playlists. As a matter of fact we have never heard a Chicken Shack song on the radio. Today Christine Perfect is better known as Christine McVie of Fleetwood Mac fame. Imagination Lady was the fifth album by the band, it came out in 1972 on Deram Records. At this time the incarnation of the band consisted of Webb on guitar and vocals, the late John Glascock of Jethro Tull fame on bass and Paul Hancox on drums. If you like that hard rock sound on the 70’s then this whole album is for you. A great example is the 5 minute drum solo on the song “Telling Your Fortune” by Hancox. Another great rocking song is the bands 6 minute 35 second version of the classic hit If I Were a Carpenter that was written by Tim Hardin, we seriously thought about doing this song instead of “Poor Boy”. For the first minute of the song Webb teases you with his twangy guitar playing and every so often the other members join for a few beats to lead you along and give you that idea of some heavy metal sound coming your way sooner rather then later in the song. For the next minute the guys jamb along and you can begin to fill the vibe picking up. At about the 1:55 mark Webb breaks into this screaming guitar solo, within a few seconds you begin to realize that the volume is a little low. You don’t have to worry just get it turned up so you can enjoy the rest of the 1:30 plus second blast of guitar. Then Stan starts to cool down the strings for about 30 seconds so the band can pick it all up again and finish the song strong. We hope that you enjoy “Poor Boy” as much as we have for 40 years. This entry was posted in Chicken Shack, Classic Rock, Forgotten Rock Classics, Forgotten Songs, Heavy Metal, John Glascock, Music, Poor Boy, Rock Band, Stan Webb and tagged Chicken Shack, Christine Perfect, Classic Rock, CS5711, Forgotten Rock Classics, Forgotten Songs, Imagination Lady, Music, Poor Boy, Record, Rock Music, Song, Stan Webb. Bookmark the permalink.